In America, graffiti is often a staple of disadvantaged communities, associated with crime and poverty, and generally unwanted. But in some places, where the culture and atmosphere differs, graffiti is a welcome aspect of the community. In a small neighborhood of Toronto, known as Kensington Market, graffiti covers nearly every inch of exposed wall along the main streets. The neighborhood is home to small, individually owned businesses — think vegan bakeries, microbreweries, tattoo parlors and art galleries — that give the area a very hip and young vibe. 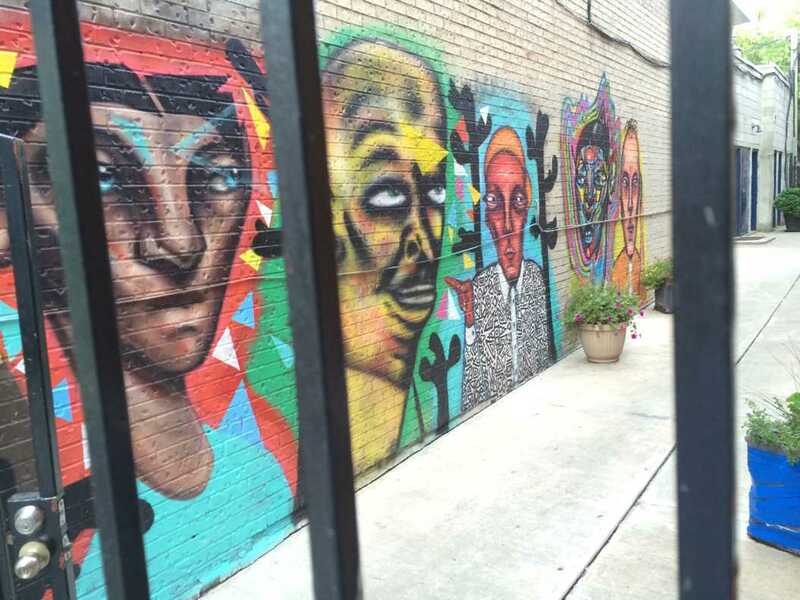 The businesses owners within the neighborhood are highly tolerant of taggers and other street artists because of the way their work embodies the character of the area. The actual art that is the graffiti isn’t much different from what you would see in cities around the U.S., but the way the neighborhood perceives and appreciates the graffiti is. Meanwhile in Oakland, beneath the Panther Hollow bridge is a large graffiti tag reading “disarm.” Though the phrase may seem out of context in the middle of a peaceful park, it’s likely a comment on the hostile state of the world today. Further down, and slightly off the trail, the word “lost,” is inscribed on a cement block with bright pink lettering. Underneath a drainage pipe that is cluttered with different graffiti, a bright white “god” stands out over the other tags — the O embellished with a halo. But despite the artistic nature of the graffiti and the message the artist probably meant to convey, people still see this type of graffiti as a disruption to the wholesomeness of the park instead of legitimate art. But when we fail to see the positive aspects of graffiti, always defaulting to what they take away from a community, we not only reduce the value of the graffiti artist as an artist but also the artistic value of the work itself. Though some graffiti does cause real property damage and criminal implications, we should still respect it as a form of artistic expression all the same. American graffiti began in Philadelphia in the late 1960s when artist Cornbread started tagging walls with his name in order to get the attention of a girl. From there, graffiti exploded across metropolitan areas, including New York, Chicago, Baltimore and Los Angeles, providing individuals with an outlet to create and express themselves in a public manner. The surge in tagging — particularly on public and private property — led to an increased need for law enforcement to regain control of public spaces. The legal system in the U.S. classifies graffiti as a form of vandalism, criminalizing graffiti and devaluing the political and social messages the artist’s mean to portray with their work. In Pittsburgh, an artist can be charged with a violation, misdemeanor or felony depending on the extent of the damage. The legal association with vandalism is a large part of the reason graffiti artists are often referred to as vandals, especially in areas where graffiti is connected to other types of criminal activity like gangs or violent crime. Like most forms of artistic expression in the United States, graffiti is protected under the First Amendment. Though artists can be punished for defacing property, they cannot be punished for using their work to express things such as political dissatisfaction. The federal government protecting graffiti in this way is important because it shows their recognition of graffiti as an art, even if it’s not the most agreeable. But this understanding isn’t always how it plays out in real life. Behind just its illegal nature, there are many ways people use graffiti that have created this negative association. In cities such as Chicago and New York, gangs use graffiti as a way to mark their territory. Even if the marking itself is not threatening to the community, the violence associated with gangs causes the community to lump gangs and their negative characteristics together with the art of graffiti. And this association makes it much harder for graffiti to exist as a legitimate form of creative expression. Our language and culture greatly influence the way we perceive graffiti. Oxford dictionaries define graffiti as “writing or drawings scribbled, scratched or sprayed illicitly on a wall or other surface in a public place.” Unlike vandalism, which is derived from the Latin word “vandalus” — meaning the willful destruction of something beautiful or venerable — the word graffiti is derived from the Italian “graphein,” meaning to write. This difference alone should be enough to show that graffiti is not synonymous with vandalism. Writing is not vindictive or destructive but a means of expression, just as graffiti is. This is something we should all be doing — recognizing art that an artist intended to be recognized as such, not picking and choosing our own definitions of art because of cultural, social or political influences. Even with its illegal status, graffiti artists and their work deserve the same amount of respect that other artists receive. The illegality of graffiti isn’t the issue — the law is important to protect property. But just because it’s illegal doesn’t mean we can’t appreciate it and view graffiti with the same mindset that we view any other art form. Though it’s more common to see on public transportation or park benches than in a museum, the value of graffiti as art is no different no matter where it is.